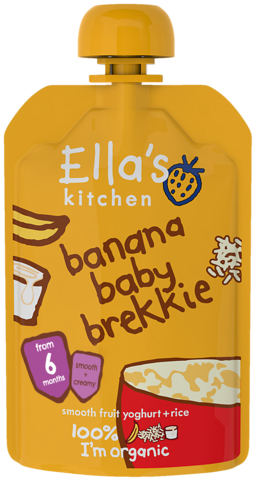 Hello, I'm 100% organic bananas, yoghurt + rice - with a dash of lemon juice and nothing else added, not even water. Who am I for? 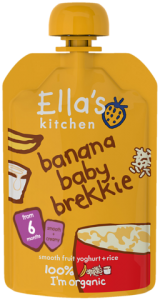 My pouch contains gently pasteurised smooth + creamy yoghurt so my ingredients are suitable from 6 months. I'm perfect as part of a filling breakfast, a snack or simple dessert. The Government advises that foods containing dairy products should only be introduced into a baby's diet after 6 months. Squeeze me into a bowl or straight onto a spoon. I'm best eaten chilled or at room temperature. Never put my pouch in the microwave.